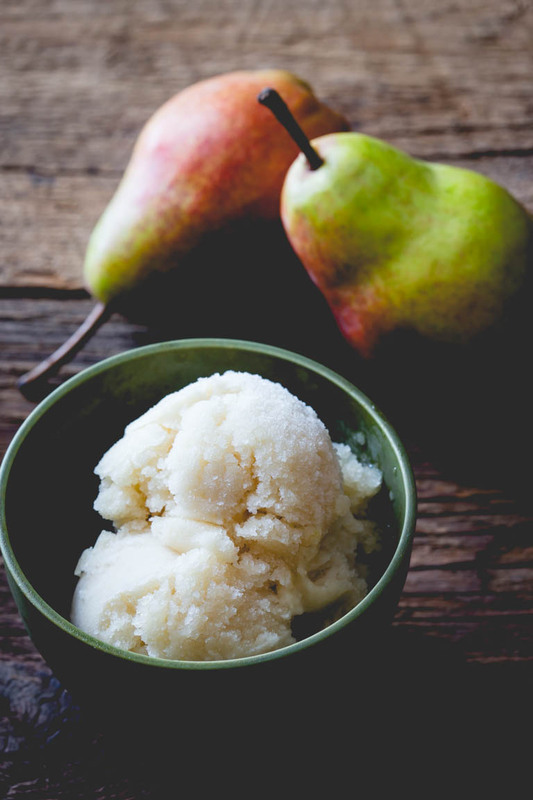 If you have never made sorbet before, get ready to fall in love. It is so simple! One of my jobs used to be making the desserts at a restaurant. And I made every kind of sorbet under the sun. The chef at that restaurant taught me that the basic ratio was 1 part fruit puree to 1 part simple syrup. That’s it! 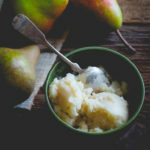 For this recipe I made the puree from pears poached in water until they are tender. It takes less than 10 minutes. Instead of simple syrup, I used our dark maple syrup and fresh ginger! Wow! It is so flavorful. Try this recipe at home this summer, or try making your own variation with some of the summer fruit! And remember you can infuse your simple syrup and fruit puree with as much flavor as you want. And for me, that means more is more! Next just chill the sorbet mixture, and then process it in your ice cream maker. At home I have a counter top electric model made by Cuisinart and it is really simple to use and clean. No salt required! 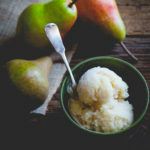 This sorbet has just the right level of ginger to tickle the palate at the end of the meal, while not overpowering the maple flavor. Though if you do like a stronger ginger flavor add more to taste. Try scooping it into tall glasses and pouring cream soda over top for a twist on a soda float. Bring pears and water to a simmer in a medium heavy-bottomed saucepan over medium-high heat. Reduce heat to medium-low and simmer until the pears are very tender, 7 to 12 minutes. 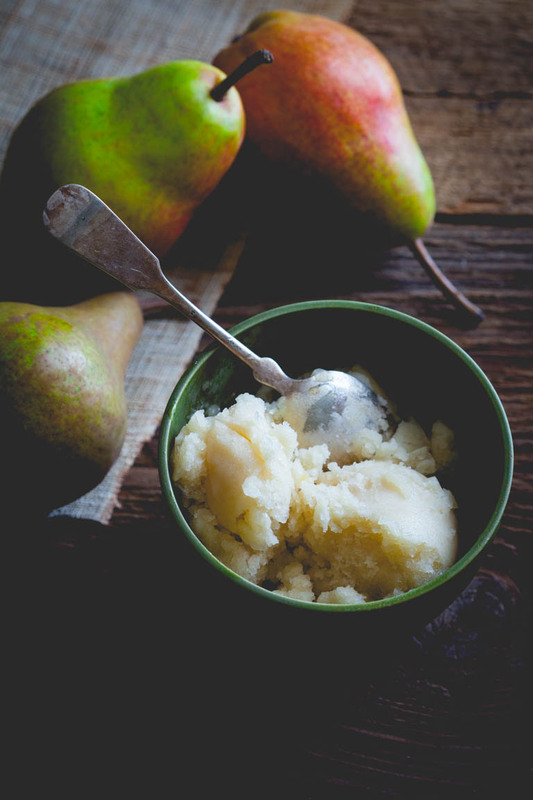 Transfer the pear mixture to a blender, add maple syrup and ginger and puree until smooth. (USE CAUTION WHEN BLENDING HOT LIQUIDS) Chill pear mixture in a metal bowl set over another bowl of ice water, stirring often until cold. Alternatively refrigerate until cold. 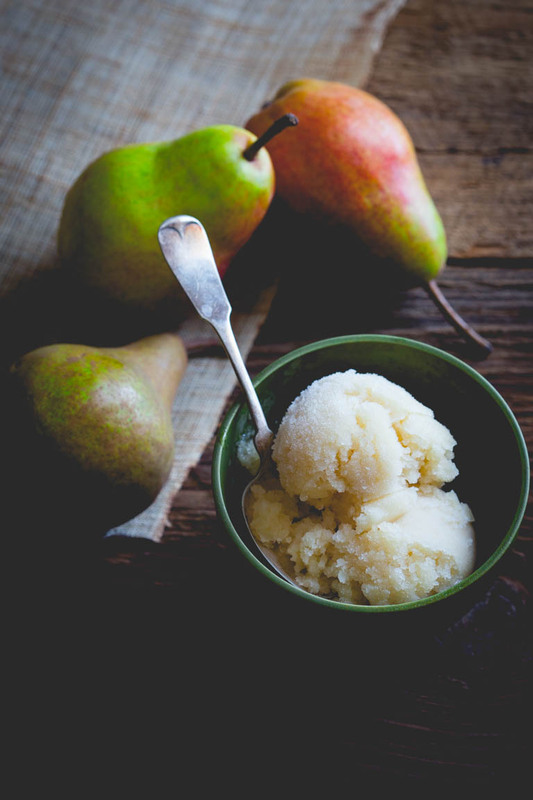 Process the pear mixture in ice cream maker according to manufacturers instructions. Transfer to a quart-sized storage container and freeze until firm.